I just finished making the first of the dolls from my christmas break sketching session. I stenciled the pattern on the velvet skirt. I was so excited about this part. There were supplies to get and paint colors to pick out. The design was going to be a lot more elaborate but man, cutting through acetate with an exacto knife is tricky! I need more practice. The rest of her turned out very close to what I’d envisioned. I love her big loopy braids although I think she might need one more braided bun. Yes, all the star wars watching is getting to me. Soon my dolls will all have queen amidala hair. Instead of my usual wool or flannel body this gal’s is heavy canvas and I love how stiff she is. I definitely want to tweak a few things on the next one but I’m very pleased with my new girl. she’s hanging with this little sheep. After all the work on her outfit I’m actually most fond of what’s underneath, her striped underthings and yarn shoes. She’s darling! Tell us please, too, about the lamb, who is also quite delightful…. Feels good to have the january crafting energy thing going, doesn’t it? She’s fantastic. Love the colours and the hair is wild. Oh I’m definitely in love. And those striped leggings are just the best. I love, love LOVE her. Great hair, beautiful dress. I have fallen in love with a dolls underthings. Hopelessly in love…Her hair is fantastic. The loops are perfect. She is just perfect! I love her leggings also! Gorgeous. The hair, the leggings, the dress, the stiff fabric body — all amazing. So cute! I love the braids. I wish I had someone to make a doll for! Cute!! I love her underthings and shoes, too. 🙂 The braids are brilliant. I love the hair on this little doll! But I have to ask, where did you get the little sheep (or did you make it)? Have you seen the Piano? Her hair reminded me of that style too. She is too cute/cool! She’s simply delightful! Of course, I’m always a sucker for redheads, braids, stripes, jumpers, leggings and mary janes. Hillary, are you in my head? This little lady is so charming and beautiful! Would freezer paper work for the stenciling? I would like to hear about the sheep too. Of all the cute things you make, I always like your dolls the best. She’s great. i love the star wars hair, too. the striped tights are adorable, as are the yarn shoes. nice job hillary. The striped “underthings” are adorable and the braids to die for. Job well done!! First, love your blog. You are so talented and creative. Second, HOW IN THE WORLD DO YOU ATTACH HAIR TO YOUR DOLLS? sorry, not shouting, just frustrated. I love the way they look and would love to make mine that way. Is there a pattern that explains it? Thank you. So much. Oh I love love love her!!! 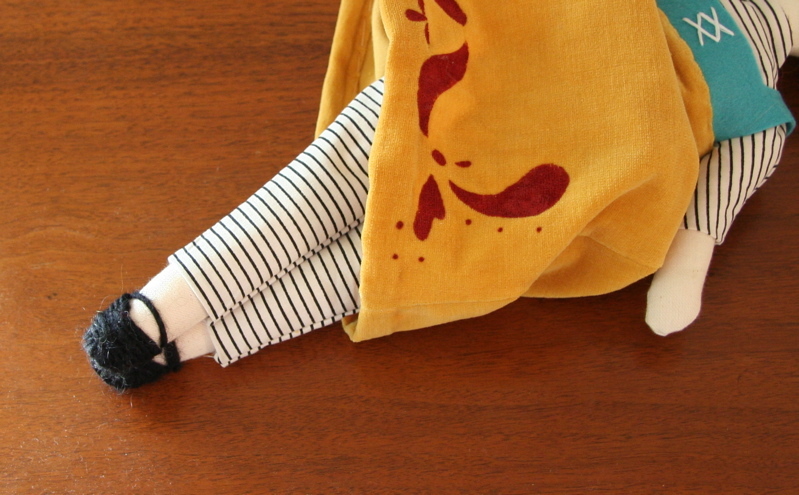 I love how there is more to the doll than you see at first: the sweet striped pants and the shoes. And the folklore stenciling is lovely too! Love them both! The shoes are so sweet and precious. Have you tried an electric stencil burner? this is amazing! i LOVE the hair, and the outfit, and-well-everything. so beautiful. Love your new doll!!! will you be offering the pattern soon? oh, she is lovely. that’s what i want to look like when i grow up 😉 well, i at least want a dress & stripes like that! she is really amazing. I’m really in love with the whole look of her – the hair, the leggings – and the dress!! i don’t suppose you will be making any to sell, perhaps?. . . either way, i certainly love and am in complete awe of your wonderful wonderfuls. keep it up!! I so love her dress. What a fabulous idea. Too cute, and I love her little lamb. As far as cutting stencils, if you’re going to be cutting a lot, it’s worth get a stencil, “burner.” I have one and it’s great. They’re not too expensive at all. You plug it in and a needle fine point gets hot so it basically melts a very fine cut into the accetate. It’s so much easirt to make curves than with an exacto! I love her! Seeing her, I think not enough dolls have sweet long dresses. I absolutely love her. . . wish she were mine! I am always amazing by the details you add to everything you make! She is gorgeous! Especially those wee little feet! Too cute. the sheep the sheep – tell me about the sheep! I totally love her hair and her long dress, and her underthings and her shoes – in fact, I love every inch of her!!! Have you tried using freezer paper to do your stencils? Cut the paper to printer size 8ish x 11ish and print your design on the non-waxed side or trace it. Cut the stencil out. Iron it to your fabric – wax side down. Paint. Let Dry. Peel off paper. Add details. She’s adorable and I love her little yarn shoes. So precious. 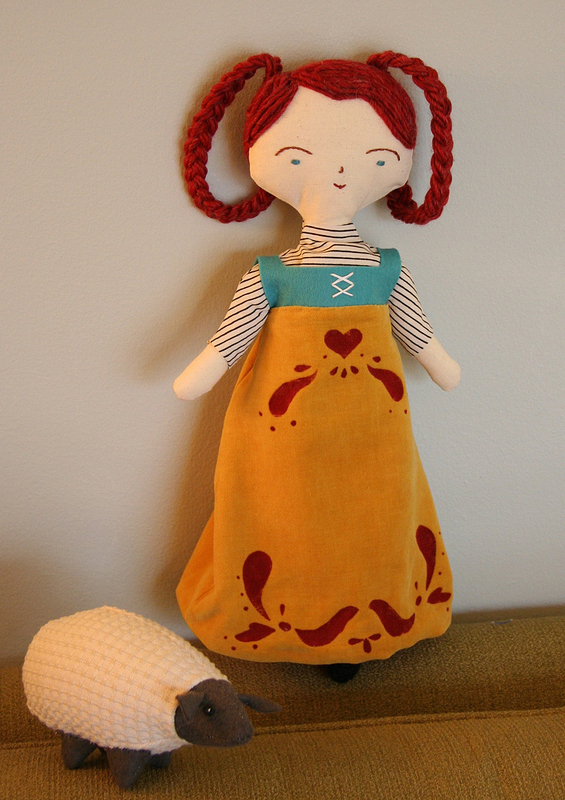 I am hoping to have enough time this year to make my nieces all their own dolls. I love the dress and the little details. Great job! You are awesome, as usual! I think I had striped leggings like that in college and I love them on your doll! I wondered what her name will be? She is BEAUTIFUL! Those shoes are awesome! Love love love your color scheme! You are so talented and creative – reading your blog is always a joy. p.s. Can I have Phoebe. She’s adorable! Love all the hair!